This Helmar series is now retired! Do you have any? Clicking on the diamond will enable you to receive the checklist via email. The Polo Grounds series, sold from August of 2010 through January, 2013, consists of die-cut portraits against a colorful image of the old Polo Grounds. There are 65 different cards. While most of the cards are single player, four cards have six players each arranged on them. These six player cards are also considered part of the Helmar 6-Up series and a few more will be issued as part of that set. Some perspective: Only 149 of the single player cards were ever offered at auction, with each selling for an average price of $25.49. For less than $3,500 one could have purchased every card ever made. One complete set has been saved for the “Helmar Archives”. 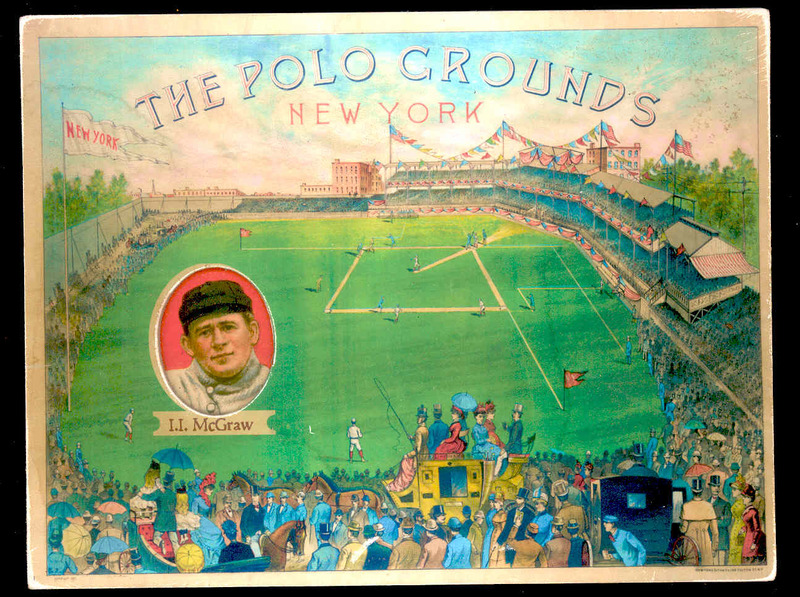 ♦ Heroes of the Polo Grounds Master Checklist. The most complete series ever on thesubject. Series now retired. Charles, I remember when you were selling the “Heroes of the Polo Grounds” and I’ve always regretted not buying the individual Jim O’Rourke card. If my memory is correct, I think I also remember seeing a card from this set with O’Rourke and other players on it. Do you have any images of these cards that you could share (front and back)? I collect all things Jim O’Rourke since I’m related to the “Orator”.